Seattle, Wash. • Megan Huff scored 15 of her game-high 25 points in the second half to lead the Utah women’s basketball team to a 58-43 victory over Washington on Sunday. It was the second straight 20-point effort for Huff, who added 12 rebounds and two blocks for the Utes (15-1, 4-1 Pac-12). Freshman Dre’Una Edwards had 14 points and 10 rebounds to go along with a career-high four assists for Utah, which scored just six points in the fourth quarter and made just 1 of its 17 3-point attempts. Dru Gylten contributed eight points and five assists for the Utes. 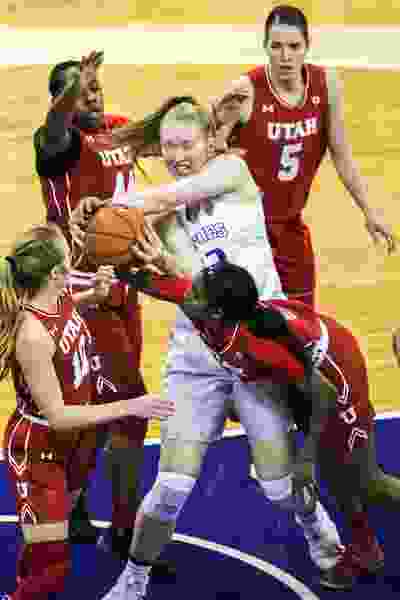 Utah shot 51 percent for the game, the fourth straight performance in which the Utes have connected on at least 50 percent of their attempts from the floor. Utah’s smothering defense held Washington to just 34 percent shooting and forced the Huskies into 20 turnovers. Utah returns to the court on Friday, when the Utes host Colorado in a 7 p.m. tipoff.